There was a Contemporary Buddhist Music (CBM) Festival kicked off at Manhae Plaza on May 18th. It started at 7 p.m. with songs and dancing of Buddhist Boys and Girls Choir. MC Sniper, Defconn and famous hip-hopers, were invited to this festival and performed fantastically on stage. All Donggukians who gathered in Manhae Plaza really got into the festival with them. here was a Contemporary Buddhist Music (CBM) Festival kicked off at Manhae Plaza on May 18th. It started at 7 p.m. with songs and dancing of Buddhist Boys and Girls Choir. 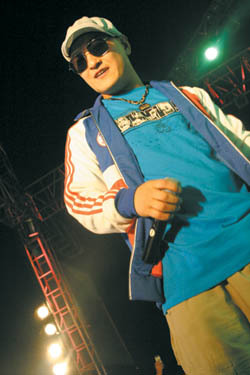 MC Sniper, Defconn and famous hip-hopers, were invited to this festival and performed fantastically on stage. All Donggukians who gathered in Manhae Plaza really got into the festival with them. I'm very excited! I 've never seen a Buddism festival like this. I've always thought that Buddhism and contemporary music are a mismatch. Now, I've changed my thought. 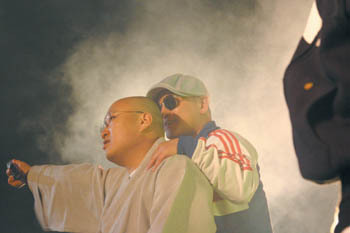 And I'm surprised that MC Sniper and Defconn are close to Buddhist,? said one student who had been shouting in front of the stage during the festival. Not only students but also President Oh and some monks enjoyed the first Buddhism festival. This is the first Buddhism festival centered on pop culture, and we want to give a fresh image of Buddhism through CBM," said a Jeonggakwon member who helped plan the festival. Donggukians can expect more changes inside and outside of the Dongguk campus as a result of the new president's ambition. They may feel a fresh wind blowing across the campus.